Chat widget status/Chat Status feature option allows you to show/hide widget. It is available under Manage section. Hide widget when no agents are available: If you want to hide the widget automatically when no agents are online to take chats, then you can turn on this option. If you want to show "Leave us a Message" form when no agents are available, you can just turn OFF this option. Enable chat widget: To show/hide the chat widget manually, set this option to ON/OFF. 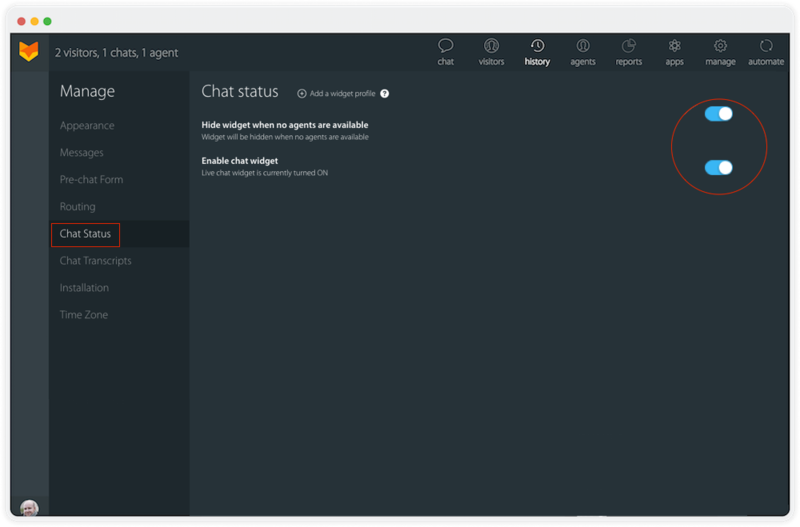 When you toggle off this option, if there is an ongoing chat the widget will be available for the customers to chat until chat ends. Note: Since Enable chat widget option has direct control to hide the widget, it takes precedence over the above option.